State Visit Month, I love you. Yesterday gave us two more state banquets to drool over: the state visit from Mexico to the United Kingdom (which has been covered in full over at the Jewel Vault, so please head thataway for discussion) and this one we're about to talk about right now. Let's hear it for the Leuchtenberg! The Leuchtenberg Sapphire Tiara with accompanying necklace and earrings, that is. Any time Silvia brings out her blue big gun, it's cause for celebration. However...(you knew this was coming...) I'm mad at this dress. I don't mind that Sil is doing a little color combining - I like that a lot, actually, because why wait for a blue dress to bust out these baubles? - but the spangles on this most figure skater-y of dresses combined with the collar* are seriously inhibiting my love of the Leuchtenberg necklace. That's too much going on up top. For shame, red dress, for shame. 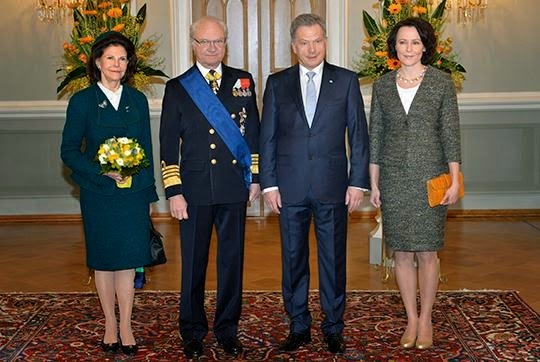 *Your Order Report: The King and Queen are both wearing the collar of Finland's Order of the White Rose. The President has on the collar from Sweden's Order of the Seraphim, while his wife has the sash of the Order of the Polar Star, a lower Swedish order also often given to members of fellow royal families that aren't either a monarch/consort or an heir. These are the primary ones on display; each is also wearing home order(s) as is typical.